In 2017, the Santa Barbara Foundation led a community wide effort that resulted in the Santa Barbara County Veterans Needs Assessment – an extensive report detailing the demographics and needs of local veterans, the various services available to them, opportunities for the community to make these resources more accessible, and much more. 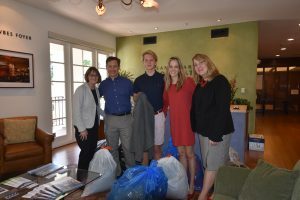 Luke Laurence (center) and his parents deliver the coats he collected to Santa Barbara Foundation North County Director Kathy Simas (left) and Chief Strategy Officer Barbara Andersen (right). 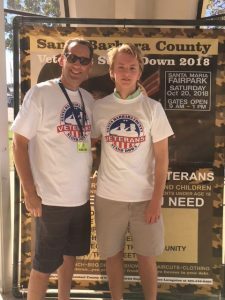 Luke Laurence, a high school senior at the Cate School in Carpinteria, read the Veterans Needs Assessment cover-to-cover and was inspired to help local veterans, particularly those struggling with homelessness. “After reading the report, one thing that stood out to me was, if I’m a veteran struggling with homelessness, how am I supposed to access more economic opportunities in Santa Barbara?” Luke said. Luke wanted to do something meaningful to help this underserved population. Each year, the Cate School offers its students the opportunity to apply for a $5,000 Mark Metherell Service Challenge grant that allows the recipient to create and implement their own service project. Last year, Luke wrote a grant proposal based on his research regarding veterans, focusing on ways to increase collaboration between organizations serving veterans throughout the county. He envisioned a unified online database that would allow organizations to share information and resources more effectively, with the ultimate goal of providing local veterans with better access to the quality care that they deserve. Luke’s project was to provide winter coats for the veterans attending the 2018 Santa Barbara County Veterans Stand Down, should they need one. Stand Down provides homeless and at-risk veterans with clothes, food, and other important resources including medical, legal, and employment services. In the months leading up to the event, Luke reached out to his extended network and utilized social media to organize several coat drives at his school and in Los Angeles, where his family resides. He ended up collecting 70 winter coats, as well as 30 blazers. Luke Laurence (right) and 5th District Supervisor Steve Lavagnino (left) attend the Santa Barbara County 2018 Veterans Stand Down in Santa Maria. Luke is right – we should be doing much more. Santa Barbara County is currently experiencing a homelessness crisis, and while veteran homelessness has decreased slightly in recent years, veterans returning to civilian life are often at risk of becoming homeless. On the federal level, the U.S. Department of Veterans Affairs has partnered with the U.S. Department of Housing and Urban Development in an ongoing effort to end veteran homelessness nationwide, and the results thus far have been encouraging. In December 2018, Little Rock, Arkansas joined a group of 65 other communities and three states (Connecticut, Delaware and Virginia) that have all effectively ended veteran homelessness. It is time for Santa Barbara County to follow their lead. The Santa Barbara Foundation is working to create pathways out of poverty for homeless Santa Barbara County residents, including both veterans and non-veterans. Through our Program Areas (Health Care, Behavioral Health, Food, Shelter & Safety), and Focus Areas (Childcare, Workforce Housing, Workforce Development), the Foundation is focused on creating opportunities to help people get back on their feet and remain there.